Washing it’s the bain of my life and if I’m being completely honest I am rubbish at it. Only recently I have looked at Ava’s white vests and though gosh they look horrid. Not because they were too small, But because I am being lazy and not separating my colours. For ease I would just throw everything into the same wash and hope for the best ! 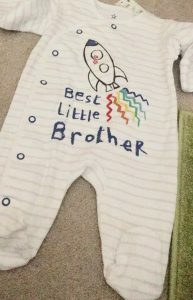 Well I have recently changed this because I was a little embarrassed to put her in some of the vests to go to nursery because what should be a white vest is now a horrid grey/blue colour. So now I have one washing baskets for the whites/ light and another for darks. The only problem I have found with this is we don’t really wear a lot of light coloured clothing apart from Ava’s vest and a few pairs of paints. So I am finding it takes me a long time to have enough lights to make up a load. Thank goodness Ava has far to many vests so I can do this. I’m sure when baby comes along we will have more washing than I know what to do with it so I shouldn’t be moaning really. The one thing I always look for when I’m buying washing detergent is something that I can use for both Ava’s clothes and ours. I’m really not organised enough .Or to be honest I cannot bothered to keep swapping and changing between detergents dependant upon what clothes I am washing. Plus now I have separated the washing into lights/darks Ava’s clothes are always in with ours. I think you can always tell a good washing detergent by if you have put it on a short wash and it has done its job . 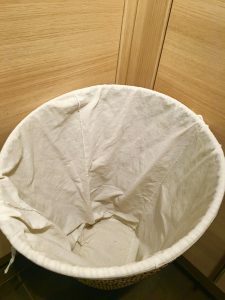 I really don’t have time for detergents that don’t work on fast washes because I generally think about my washing last thing of an evening and need to get it done quickly before I try to go to bed myself. 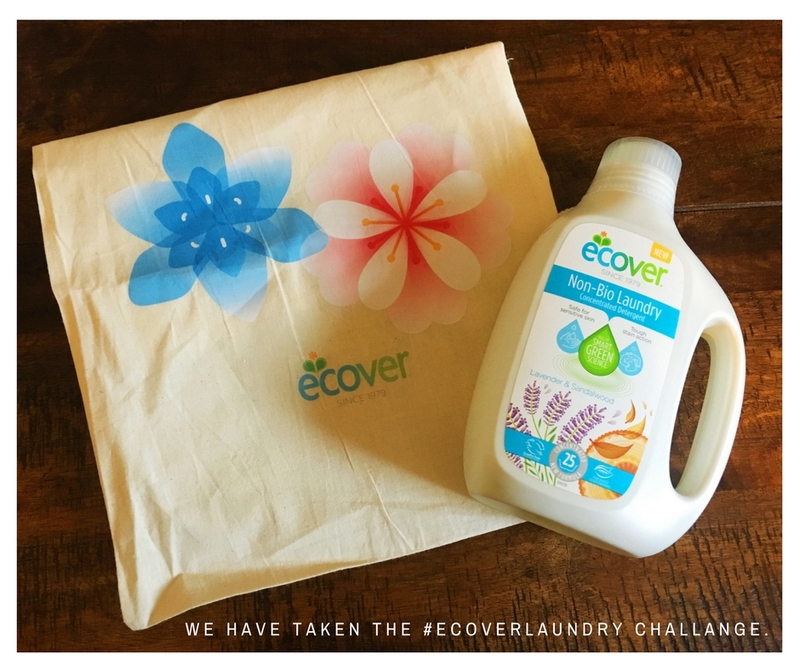 So for the last week now we have been using Ecover Non-Bio Laundry detergent . The one we were sent for review was the concentrate version that was Lavender and Sandalwood scented. Now I’m not normally one to go for a strong-smelling washing detergent were pretty plain Jane when it come to washing detergents. So I was a little apprehensive to if I would like it or not. It smelt lovely in the bottle not too strong but strong enough that I could tell it was scented. I personally think you get to smell the true smell once the washing has been on the airier for a few hours. So I did my late night rush of a wash the other night as I realised it was Jeans for genes at nursery and Ava had no clean jeans to wear ! put it out to dry and went to bed. As soon as I came down in the morning to where the washing was I could smell it and it smelt amazing. I can even smell it on clothes that have been washed, ironed in a fashion and put away. So Ecover may have converted me into being more adventurous with the fragrance of my detergents. Also like I said earlier I’m one for sticking everything on a fast wash unless it is poo covered then I may put it on a long wash. So I need a detergent that will work on such a short wash. considering you only need 35ml of detergent for a standard load of washing. It cleaned my clothes really well I couldn’t see any marks on them when they came out. Which in my books is a winner. It says on the bottle you can get 25 washes out of a 875ml bottle but I wouldn’t be surprised if I got more than that. As it really doesn’t take a lot of detergent for it to do the job. 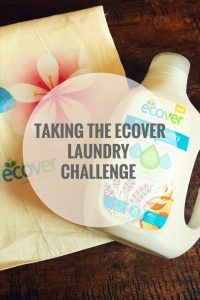 I would recommend Ecover Laundry detergent if you’re wanting a product that works on a fast wash and smells lovely. I know this sounds really sad but I’m actually looking forward to washing our bed sheets in Ecover. As there is nothing better than getting into a freshly washed bed and if it smells this amazing each night I cannot wait. 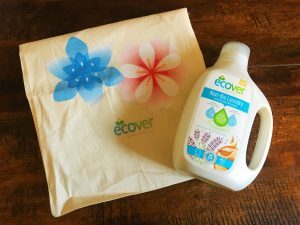 Also I do need to thank BritMums and Ecover for sending me the products as for the first time in for as long as I can remember my washing basket is empty !! now to tackle the ironing.